This article comes from http://photojournal.jpl.nasa.gov/catalog/PIA03473 from 2002. Unexpected dynamics in Jupiter’s upper atmosphere, or stratosphere, including the birth and motion of a dark vortex wider than Earth, appear in a movie clip spanning 11 weeks of ultraviolet imaging by NASA’s Cassini spacecraft. The development of the vortex resembles development of ozone holes in Earth’s stratosphere in that both processes appear to occur only within confined masses of high-altitude polar air. That similarity may help scientists understand both processes better. The movie is the first from any spacecraft to examine the planet’s churning atmosphere in ultraviolet wavelengths. Hydrocarbons in Jupiter’s stratosphere are transparent at the longer wavelengths of visible light and infrared light, but appear as haze in ultraviolet light. Cassini’s narrow-angle camera took images from a near-equatorial perspective as the spacecraft approached Jupiter from Oct. 1, 2000, to Dec. 15, 2000. The images have been combined and re-projected into a movie view as if looking down on Jupiter’s north pole. Contrast was enhanced to reveal faint features. The view extends south to the equator at the corners of the frame. 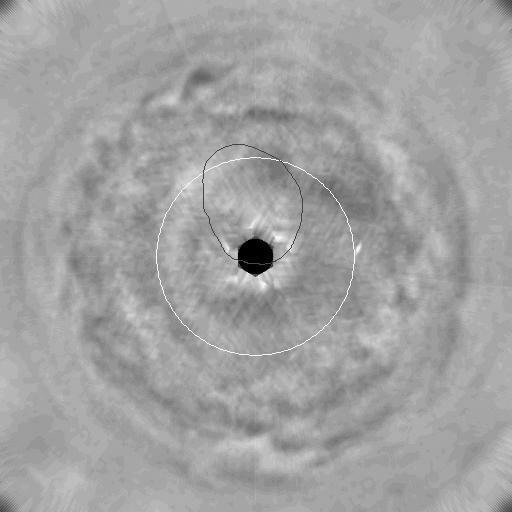 The black dot right at the pole is where no presentable data were acquired, due to Cassini’s viewing angle. For reference, a circle of 60 degrees latitude is superimposed in white, and an oval where Jupiter has a persistent aurora is superimposed in blue. The aurora itself, comparable to Earth’s Northern Lights, is not visible here. Energetic auroras heat the stratosphere and stimulate the formation of complex hydrocarbons from the breakup of methane molecules. A dark patch appears and within two weeks becomes a well-defined oval about the same size and shape as Jupiter’s southern hemisphere Great Red Spot. While this dark vortex is nestled inside the auroral oval, its outer edge begins to circulate in a clockwise direction and it develops a small, brighter, inner core. It eventually moves out of the auroral region and deforms by flattening in latitude and growing in longitude. Near the end of the movie, a second, smaller, dark oval appears nearer to the pole and deforms in the wind shear. A series of wave features rings the planet south of (outside of) the latitude-60 circle. These make visible some of the dynamics of how haze generated in the confined polar stratosphere mixes eventually into the winds farther south. Comparison of this ultraviolet movie with a near-infrared movie that was produced the same way and released previously (PIA-03452) reveals many differences. Instead of the waves and large vortex seen in the ultraviolet, the infrared imaging shows a multitude of small storms and parallel wind bands at a lower elevation in the atmosphere. Cassini made its closest pass to Jupiter, about 10 million kilometers (6 million miles), on Dec. 30, 2000, and proceeded toward its ultimate destination at Saturn. For more information, see the Cassini Project home page, http://saturn.jpl.nasa.gov and the Cassini imaging team home page, http://ciclops.lpl.arizona.edu. The imaging team is based at the Boulder, Colo., campus of the Southwest Research Institute. Cassini is a cooperative project of NASA, the European Space Agency and the Italian Space Agency. The Jet Propulsion Laboratory, a division of the California Institute of Technology in Pasadena, manages the Cassini mission for NASA’s Office of Space Science, Washington, D.C.